You will be charged applicable shipping charges when your order is processed. The shipping charges will not be reflected in the final price within our online store. Please see the Shipping States and Rates chart below for your charges. - All orders will be processed as quiickly as possible. We ship on Mondays and Wednesdays. - We ship to ost states via UPS ground. 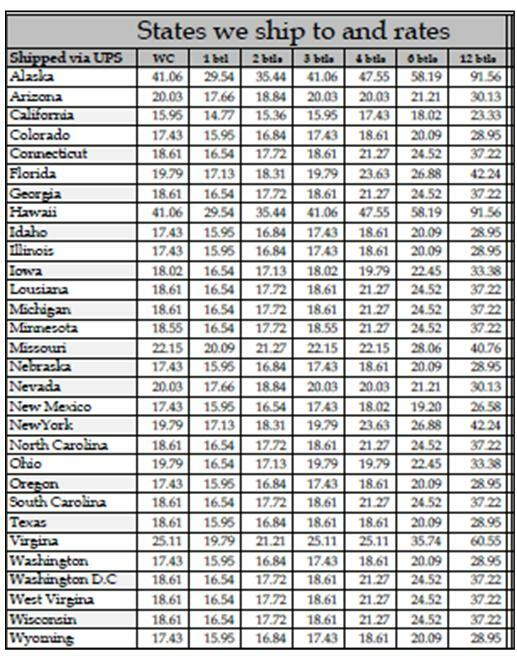 Please see the Shipping States and Rates chart below for a list. - We do not offer interanational sales or shipping at this time. - Wine cannot be delivered to PO Boxes, so please provide a physical address where someone 21 or older can sign for the wine. - UPS will attempt to deliver packages containing alcohol 3 times before sending it back to us. - If a package returns, please ontact Natalie at 951-699-8896 X107. a re-shipping fee will be applied to all orders that are sent back out.